Her critics say she is leading the party to disaster. He’s his own worst critic (= he judges himself severely). The critics hated it, but it was popular at the box office. Several of the newspapers were calling for his resignation. Protesters were calling for a ban on the production of GM foods. The advert said ‘We are an equal opportunities employer’. I put an advert in the paper to sell my bike but I haven’t had any takers. Dad was furious with us. I was late and he was furious with me. He‘s furious about/at the way he’s been treated. They were furious at not being invited to the party. 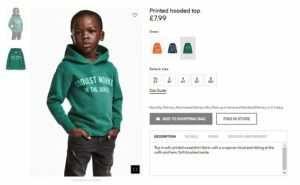 High street giant H&M has come under fire over a controversial advert for a children’s top which shoppers have labelled ‘racist’. 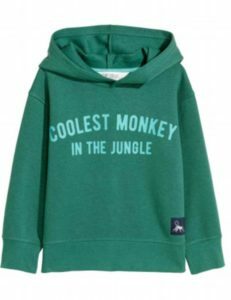 The Swedish fashion chain is selling a green hooded top on its UK and US websites emblazoned with the phrase ‘Coolest Monkey in the Jungle’. The image, which has since been taken down from website in the wake of the uproar, shows a young boy modelling the £7.99 hooded top. The government has come under fire for its decision to close the mines. The government will come under fire again when the latest crime figures are released. He was always labelled as lazy. We shouldn’t label these boys as criminals so early in their lives. Her latest movie has been labelled a disaster by the critics. The slogan was emblazoned in red paint. Airport security was extra tight in the wake of yesterday’s bomb attacks. An inquiry has been set up in the wake of the crash. The book caused an uproar in France. Mr Stone’s latest film has caused an uproar. David is modelling a grey suit by Armani. I used to model when I was younger. 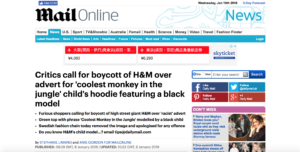 Customers took to Twitter to question whether H&M were being ‘casually racist’, pointing out that ‘monkey’ has long been used as a racial slur. Even those who doubted the brand was being racist admitted there should have been more awareness of how the image could be perceived. The campaign group Models Of Diversity, which pushes for more diversification across the industry, said H&M should be ‘ashamed’. He apologized for shouting an ethnic slur at a fan. How do the French perceive the British? Women’s magazines are often perceived to be superficial. America is perceived of as being less class-conscious than Britain. We are pushing for a ban on nuclear testing. Local residents are pushing for the road to be made safer. He’s pushing us for a decision by tomorrow. I regret the incident and am deeply ashamed and embarrassed. I felt deeply ashamed for my father’s impoliteness. Other Twitter users were also quick to weigh in on the debate. I was dismayed to discover that he’d lied. Advertising agencies sometimes use religious imagery to sell products. The imagery in the poem mostly relates to death. I just wanted to weigh in with some comments. Several leading architects weighed in with criticisms regarding the design of the new museum. The all-night debate is nothing more than a publicity stunt. Others pointed out there appeared to be no racial undertones but asked whether there had been a significant ‘oversight’ in the advertising campaign. The online listing for the garment, which is made for children aged 18 months to 10 years, is still available to buy online but no longer features the image of the child model. It was a comedy act with an undertone of cruelty. His remarks carried an undertone of anger. They claimed it was simply (an) oversight. Because of a bank oversight, the money had not been credited to my account. Employees were paid late due to an oversight in the accounting department. I’ll check the TV listings to see what’s on tonight. The site maintains a listing of free events for children in the area. He’s fussy about how a garment fits him. In October a shopper vented her frustration about children’s Halloween costumes in the store which were not gender-neutral. Poppy Lambert-Harden, from Brighton, was shopping with her mother when she discovered that her favourite outfits were in the boys’ section of her local store for the second year running. The observant five-year-old had the same problem last year and was forced to buy a skeleton costume from the boys’ section of the store, after complaining girls’ costumes ‘weren’t very scary or cool’. And the shop has also faced the wrath of customers for the way it sizes its clothes. There’s no need to vent your anger on me. Please don’t shout – there’s no need to vent your frustration/anger/rage/spleen on me. I didn’t mean to upset anyone, I just needed to vent. He feared the wrath of his employer. The people feared the wrath of God. He left home to escape his father’s wrath. One size 14 blogger posted a photograph of herself attempting to squeeze into a size 16 dress being sold by the retailer. And in August, Samantha Bell shared a picture showing how a pair of size 16 jeans from the retailer appeared to be significantly smaller than a Primark pair. It has previously been suggested that a discrepancy between UK and European sizing at H&M means that shoppers struggle to fit into their usual dress size at the store. Do you think I could squeeze into this top? I might be able to squeeze in one more person. There is some discrepancy between the two accounts. There were some discrepancies in the statement he gave to police.